Last night’s event at a packed out Friend’s Meeting House in Euston, entitled Resistance: the Best Olympic Spirit, was truly inspiring. 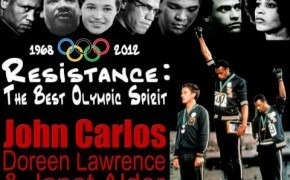 We are glad to be able to post the audio of the speeches made by John Carlos and Janet Alder below. Tony Ball, leader of Basildon Council and architect of the Dale Farm eviction, was forced to flee an awards ceremony by angry protesters in central London last night. our fallen comrade. We encourage all antifascists and radicals to join us. Last night council tenants, squatters, private tenants and MPs gathered in Parliament to consider the next steps in the campaign for secure housing.